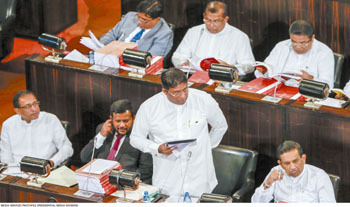 The broad policy thrust of Budget 2017, which was presented to parliament on 10 November by the Finance Minister, is positive and the need for fiscal consolidation has been taken on board. This is reflected in the estimated budget deficit of 4.6 percent of GDP for 2017. If achieved, this would be an improvement on the 5.4 percent provisional budget deficit in 2016 and a significant improvement on the 7.4 percent budget deficit of 2015. Revenue is projected to improve to 15.5 percent of GDP, from 13.5 percent in 2016, and expenditure is projected at 20.2 percent of GDP (up from 18.9% of GDP) with recurrent expenditure remaining at 15 percent of GDP (the same as in 2016). THE MACROECONOMY Fiscal consolidation of this nature is a key element in reinforcing the recent improvement in global market confidence in the Sri Lankan economy. Sri Lanka’s ability to tap global bond markets to roll over external debt obligations is a key determinant of macroeconomic stability. And market confidence in fiscal direction is an important element in enabling access to the global bond market. Therefore, adhering to the budget proposals and implementing revenue measures in particular will be essential to maintaining macroeconomic stability in 2017. GOVERNMENT INCOME The revenue proposals in Budget 2017 are somewhat ambitious. But there’s a chance of these targets being met if the envisaged administrative improvements to revenue collection are implemented in a very robust and effective manner. The projected increase in total tax revenue in 2016 is 5.6 percent, whereas the estimated growth for 2017 is five times higher at 27.2 percent. Income tax revenue is expected to grow by 42 percent; and even considering the revisions to the income tax rates and thresholds, this is rather ambitious. Furthermore, income taxes correlate to economic growth, and 2017 is likely to be a year where consumption and economic growth are constrained by elevated interest rates, tighter fiscal conditions due to increased consumption taxes and a weak global economy. Therefore, the boost to tax collections from nominal economic growth (real economic growth plus inflation) would likely be limited. There would need to be a significant improvement in revenue administration measures to ensure that the income tax revenue target is met. TAX REVENUE Even with the increased contribution from income tax in 2017, the direct-to-indirect tax ratio in 2017 is projected to be 18 percent-82 percent. However, contributions to the increase in tax revenue indicate a slightly better ratio, with income tax increases contributing 25 percent to the higher tax revenue in 2017. 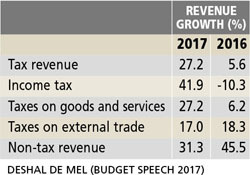 The estimated rise in taxes on goods and services is likely to be met, considering the sharp increase in Value Added Tax (VAT) that will have full effect next year. Whilst this increase in indirect taxes will hurt consumption and constrain aggregate demand in the economy, it ought to be seen as a necessary measure – at least in the short term – to enable fiscal consolidation. TRADE IMPACT Increased tax revenue anticipated from external trade may be optimistic, considering the government’s projected growth in imports in 2017. During the course of next year, it is likely that imports will be hampered by elevated interest rates and subdued domestic demand. The lower loan-to-value ratio on motor vehicle imports will likely dampen vehicle imports – and this would undermine the estimated increase in revenue from excise duties on motor vehicles. The government has also proposed to remove cess from 100 items. This is a positive measure in terms of transparency of trade taxes and shifting away from a habit of ad hoc para-tariffs, but is likely to reduce potential revenue from external trade. POLICY DIRECTION In aggregate terms, whilst revenue is likely to fall short one could expect this to be contained. And there’s a much lower risk of the government losing control of the budget deficit like it did in 2015. It does however underline the importance of implementation of the measures proposed in the budget. Considering the policy directions of the budget and key expenditure proposals, the broad thrust is again positive. There is an attempt to shift away from handouts and focus more on building economic capacity. To this end, steps are being taken to rationalise tax exemptions, ease barriers to doing business, place an emphasis on the implementation of revenue administration improvements (through RAMIS) along with trade facilitation measures, address barriers to female participation in the labour force and implement flexible work hours, free up state land for private and PPP use, and support non-state degree-awarding entities to expand to provide tertiary education. At the same time, there are negatives as well – for example, an increased level of directed lending for banks, attempts by the state to replicate platforms of hotel booking sites (whereas alternative models can be explored for obtaining legitimate tax revenues from such entities) and continued import substitution in the agriculture sector.